Are you looking for a unique luxury boat to cruise today? Private, intimate, or with a small group? Private Canal Cruises specializes in last minute cruises. Because we have our ships with a captain on board on standby in the city centre, we beat all other companies in delivery time. If we are not already booked, you can board sometimes within half an hour! Just call us and you know our availability immediately! 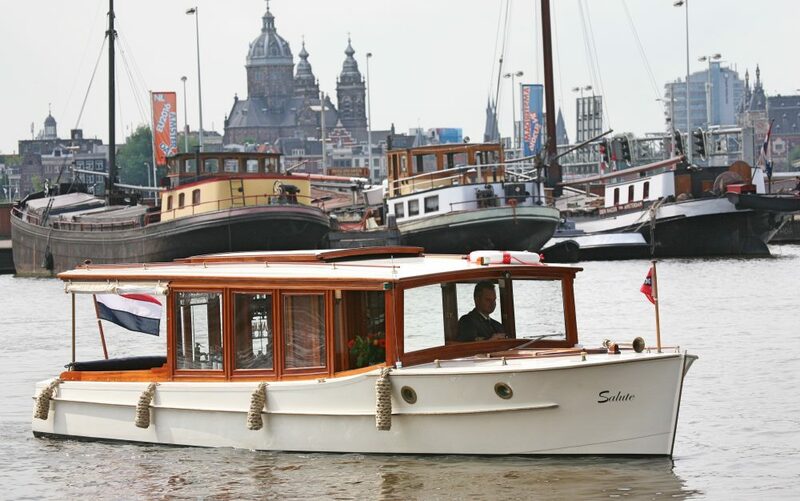 The Salute is the most exclusive small saloon boat of Amsterdam. A good heating system and double glazing in the salon ensures that you always have a perfect panoramic view. The windows open and in the back of the boat you can sit outside. In the beautifully restored classic sloop ‘Style’, built in 1914, you will experience Amsterdam in style. The mahogany bar with a large variety of champagnes, wines and other cold drinks is a real eye-catcher. Coffee and tea are also available. We even have a hidden toilet on board. Provided with all modern comforts. Qualified and highly motivated captains with all licences. You can already cruise with us for 1 hour. However, we recommend to rent the boat for at least 1.5 hours, because the time flies when you experience Amsterdam on board. This gives us the opportunity to show you the smaller canals where other boats can’t come. In 2 hours or more you can also admire the lesser-known parts of Amsterdam and make the most of what Amsterdam has to offer. Do you want to cruise tomorrow? Then it is also best to call us for availability. so that we can send you an invoice with a payment link to complete your booking. Do you want to cruise the day after tomorrow or later? Please use our contact form and we will let you know as soon as possible that we reserved the time for you and send you the invoice with payment-link to complete your booking. Of course you can always call us. Both boats have a fully stocked bar and you don’t have to order in advance. Would you like to order some bites, lunch or a la carte dinner during your cruise. View our menus and barlist here.